Compère Lapin (kom-pare la-pan) n. 1. French for “brother rabbit” 2. traditional Caribbean and Creole folktales featuring a mischievous rabbit named Compère Lapin 3. Restaurant helmed by Chef Nina Compton in the heart of the Warehouse Arts District in New Orleans. Nina Compton was the St.Lucian runner up and fan favorite on Bravo's Top Chef: New Orleans. 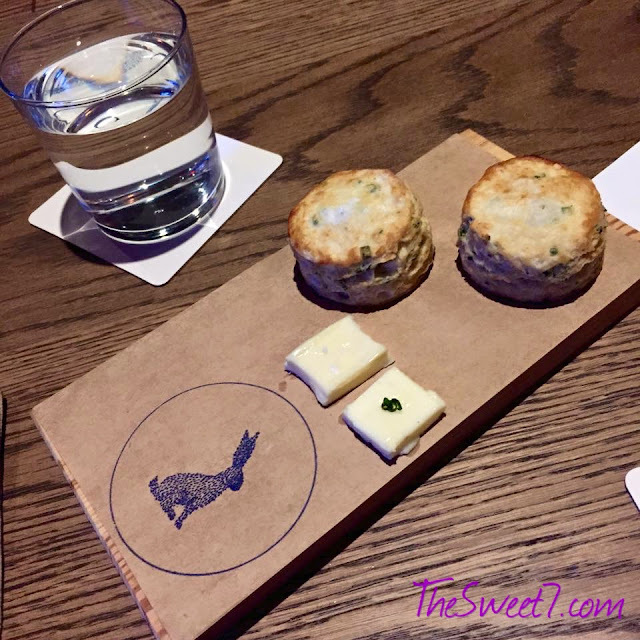 A May-end weekend trip to New Orleans afforded a St.Lucian friend and I, a first experience to the preview dinner menu of Compère Lapin by Chef Nina Compton. We had a 8pm seating reservation on Friday, May 29th in Chef Nina Compton's new restaurant in New Orleans' Warehouse Arts District, located in the Old No. 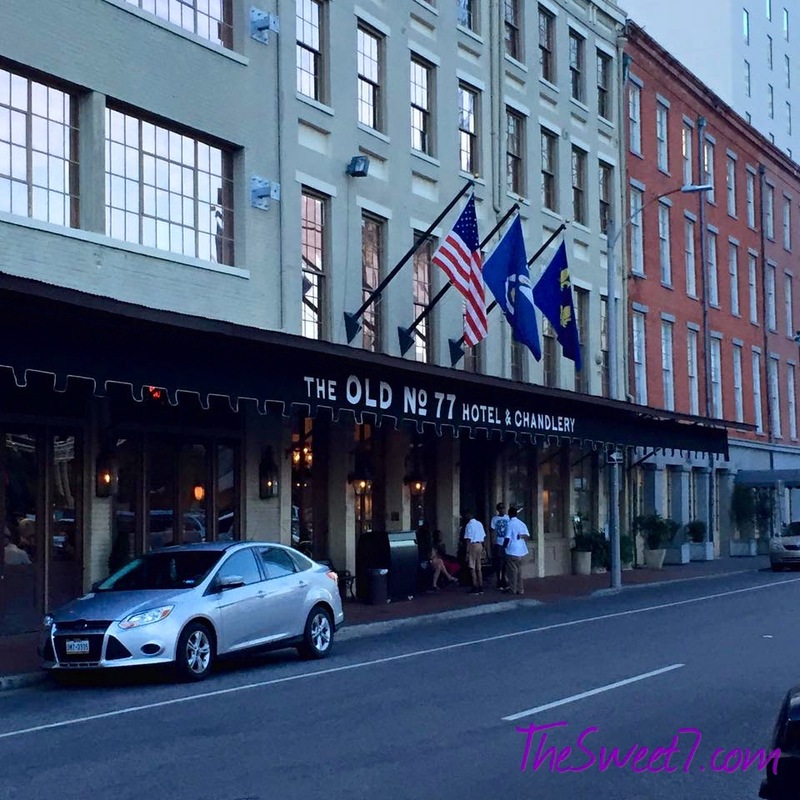 77 Hotel & Chandlery, New Orleans' newest hotel. Despite finding time for numerous hotel room selfies, Dr. Natacha Mortley and I were not a minute late for our 8pm dinner reservation. Not wanting to walk the streets of NOLA in our heels, unsure of the distance between the restaurant and our hotels, we jumped in a taxi. Just as we were priming for Taxi Cab Confessions - the selfie chronicles, I swear not more than a minute drive, the taxi cab driver said, "I think we passed it." We looked back and there it was Compère Lapin in the Old No. 77 Hotel & Chandlery. Upon arrival, the Maître D' took our names and asked us to follow her. She mumbled something and left us for about thirty seconds standing among tables of patrons already dining from earlier reservations. When the Maître D' returned, she asked us to follow her. This time returning us to the entrance of the restaurant. While following her, I thought maybe Natacha and I were a little too enthusiastic about our dinner reservations, and arrived five minutes too early for what was our 8pm seating time. Instead, the Maître D' had us sit at a corner table in the front entrance of the restaurant. In Caribbean terms, a good table to 'MACO' (to be nosy). I got a bird's eye view of the restaurant, the patrons entering and leaving, even the strollers on the ever so hard tongue tying street name - Tchoupitoulas. Actually we got PRIME seating because this corner spot enabled us to view Chef Nina Compton hard at work. While her husband Larry popped in and out of the kitchen for support. All so worth it! Up walked our waiter Colin. He just gave me CALI surfer dude ... quite pleasant. And once Colin introduced himself, it was followed by the appearance of that mischievous rabbit, Compère Lapin. Compère Lapin popped up on our blue menus, I spied him under my beverage coaster throughout the night and kissed him maybe one, two times as I dabbed my mouth with my paper napkin. Herb Biscuits with a choice between bacon or a sweet butter. Am I like the only mother who had dreams of sitting in the wine aisle of a supermarket, opening bottles of wine while pregnant? Well, wine is exactly what I craved when I was pregnant with my son. It's not like I was ever a wine drinker to begin with but since my son Nikail's birth, I love whites, nothing fancy. Shout out to Sutter Homes Moscato. Barefoot Moscato will suffice too. Although on a recent trip to Los Angeles, I got tingles sipping on Sip Moscato, shout out to you too! Enough talk about moscato, I'm enjoying a tequila margarita right now anyway ... so back to the story! That evening I decided to be a little exotic with my cocktail selections and ordered Panache (which reminds me, what ever became of that Caribbean magazine?) which consisted of IPA, Lemon, Elderflower and Aromatized Wine. Let's just say CLUELESS! Clueless about IPA or aromatized wine, but I had some semblance about elderflower. Since I am telling you about my Compère Lapin dinner experience, I researched. IPA is India Pale Ale. OK, so beer with elderflower. Elderberry also called elder flower, is a tree that bears cream-colored flowers, followed by dark purple berries in autumn and was once referred to as “nature’s medicine chest.” Aromatized wines are wines that have natural herbs, roots, and/or spices added to give additional flavors. The final drink for the evening was Road to Fallbrook and that contained Tequila (currently my favorite alcohol. I just enjoyed a 375ml bottle by my lonesome during L.A Carnival - my word, I had wings. I FLEW! ), Campari, Lime, Cinnamon & Avocado. Final drink too because this time we had plans to walk down Bourbon Street from Tchoupitoulas Street. Who knew blended avocado could be used in a cocktail? Think creamy! And while I have never been a fan of Campari, I did remember my brother since it is his noted drink. Did you know that Campari is made in Italy? I discovered that while on a Mediterranean cruise last year. Between the two cocktails of the evening, I preferred Road to Fallbrook which was a pleasantly creamy and surprisingly consisted of avocado. While Panache was a little too soft on the liquor side for me. And to be honest, I have never been much of a beer drinker. Next trip to Compère Lapin in New Orleans. I want to be served Abuelita Daquiri, I spotted the usage of plantain in this cocktail! Do not expect to chew on pieces of conch, or else you would be disappointed. I got over my expectation of chomping on pieces of conch very quickly when I remembered the texture of 'croquettes' from my days of living in Miami. A croquette is a small breadcrumbed fried food roll containing, either mashed or grounded usually main ingredients. The croquette is from the French word 'croquer', "to crunch". So inside that crunchy exterior batter is conch in a paste form. Now can we talk about that pickled tartar sauce? OMG, if I was at home, I would have dipped my finger in that little dipping bowl, and licked my finger and that bowl clean! It was that good! So much better than a bottle of store bought tartar sauce. It can be compared to my love affair with only KFC's coleslaw ... UNBEATABLE! Another dish that my only thought was *if only I was at home ... I would kill* was that succulent shrimp. I was trying to be dainty and show my best table manners. As a Lucian, I wanted to be a wonderful representative for St.Lucian Chef Nina Compton. I used my knife and fork to eat my shrimp, also because I was wearing white, but what a task! I suppose the Maître D' saw the painstaking task of me trying to eat shrimp with a knife and fork, he brought over a few wet naps. It was at that point I finally got the memo that this top notch dining experience was giving me the OK to relax and get comfy! Yet, these 3 babies were already in my tummy. While most of the night Chef Nina Compton was in her kitchen, at one point she managed to stop by our table to say HELLO. During a brief chat with us, a gentleman seated at a table beside us interrupted, asking whether Chef Nina would mind taking a picture with him and his date. He was starstruck, excited and it really hit me, our Saint Lucian, Chef Nina Compton definitely is now an American celebrity! And just like that, she moved along to take a picture with her fans. So through out the night, I managed to sneak a few pictures of her in her kitchen! Her husband Larry looking over her shoulder. I could call Larry, "Mr. Caribbean" like my cousin often refers to my husband. While Nina is our TOP CHEF, Larry is definitely the heart and soul of this establishment. He gave it life! Early in the evening, when Larry visited our table and discovered we were St.Lucian, he immediately told our waiter Colin, "Do not piss off a St.Lucian woman." We laughed. And I was thinking, *Nina has got you trained well, 'cause you are so right! * LOL. Larry immediately asked which part of the island we were from. I said "Gros Islet!" and he proudly responded, "My mother-in-law is from Gros Islet." Our first natural response was "Oh, we know!" Saint Lucia is that small ... and Nina's family is well known, her father was St.Lucia's first Prime Minister when we the island gained its independence in 1979 from Britain. Her dad was most notably touted as "The Father of Our Nation." Here's a wonderful article about Chef Nina Compton. Well if you know me, the minute I land in Miami and I never fail to do so, I eat curried goat. I love it that much! My SweetSvn instagram reveals. And I was happy to finally try Chef Nina Compton's gnocchi. During her time on Bravo's TOP CHEF she seemed to love making gnocchi which I had never tasted before then. Even more interesting how she infused plantain in her gnocchi. Now, the world stops with her curried goat! OMG ... I thank the heavens. Ever had pulled pork? Well that curry goat reminded me of pulled pork, taking me back to my life in Miami. That goat just shredded. So tender enough to be pulled into thin strips! And mighty delicious ... gave a good kick! Darn it ... I was so stuffed by dessert that I did not have any. Let's just say, I still regret it! LOL. Yet, this gives me one more reason to return to Compère Lapin and New Orleans. Caribbean restaurants usually are so dingy and tacky, despite the good food. Compère Lapin in American terms hits with a "Home run", in Caribbean terms "Sixes". The restaurant and food are superior. The restaurant's energy has a charming elegance, while the food is an unusual and exotic blend of Caribbean, Hispanic (Miami) and Italian food. There was something about Chef Nina's food that also reminded me why I love Thai food. With each bite, especially that curried goat and plantain gnocchi there were bursts of flavor. Each component let's you know "I'm here!" As a fellow Saint Lucian, I felt so proud. Nina Compton is elevating the St.Lucian standard beyond our wildest dreams! Even my favorite chef, Emeril Lagasse had this to say a couple of weeks after my visit,"Killer dinner last night at Compére Lapin in the Warehouse District, Nola!" I tried not to over do it with the pictures but take a bit of a look. Also a young white Maître D walked over with a strong Caribbean accent, and said I hear your accent, "I am from the Cayman Islands." It was so good to be surrounded by more of our own. That's Caribbean people for you. And the cute bartender was easy on the eyes, especially since he too was in view! So insider secret from that night, GOT TO LOVE LARRY! Larry loves our St.Lucian liquor too! Saint Lucia Distiller Chairman's Reserve will be sold in Compère Lapin. Winward & Leeward Brewery please note Larry is wishing for a shipment for Saint Lucia's very own Piton Beer. Don't make us wait. LOL. And just like that .... our bill comes to our table, "Laissez les bon temps rouler!" TRANSLATION: Let The Good Times Roll!